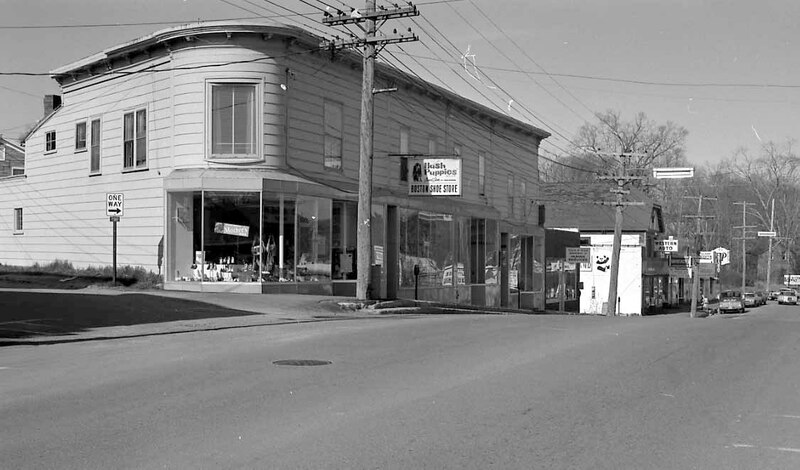 The Historical Society was saddened to hear the news of the closing of the Boston Shoe Store, shown above in the 1950’s when the block from the corner of Monroe Street to the Angelholm, then Williamson’s Fish Market, did not contain even one empty storefront. 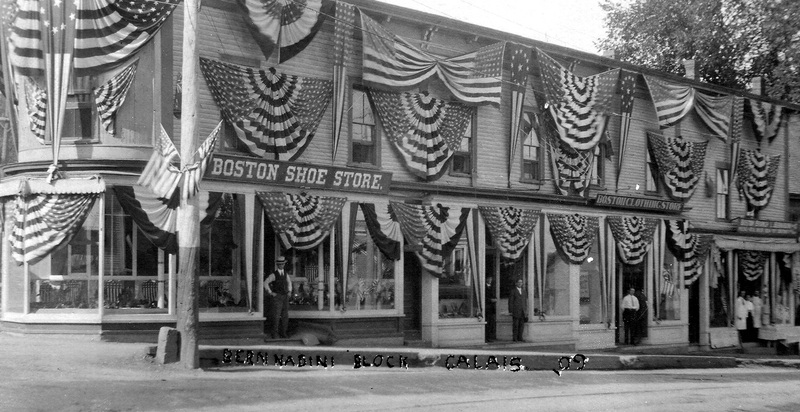 By our calculations the Boston Shoe Store opened its doors about 1885, 131 years ago although it was not always operated by the Bernardini family and it was not originally on the corner of Monroe Street. This photo was taken in the late 1890’s. 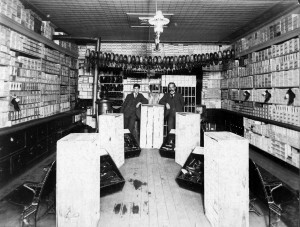 The Boston Shoe Store was then owned and operated by Willard Foster and was located just below the corner of Monroe Street. 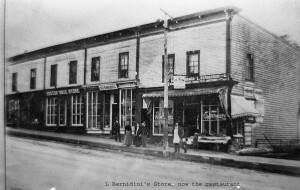 Luigi Bernardini, the patriarch of the Bernardini family, can be seen standing on the sidewalk in front of his fruit store, the Boston Branch of L.Bernardini and Co. Luigi arrived in Calais between 1890 and 1896 when his fruit market is first listed in the Calais business directory. At the time he rented the store and the family slept in the back. Luigi was one of several Italians who settled in Calais during this period who opened fruit and confectionery stores. Others wereChecchi, Dimitri and Tori. 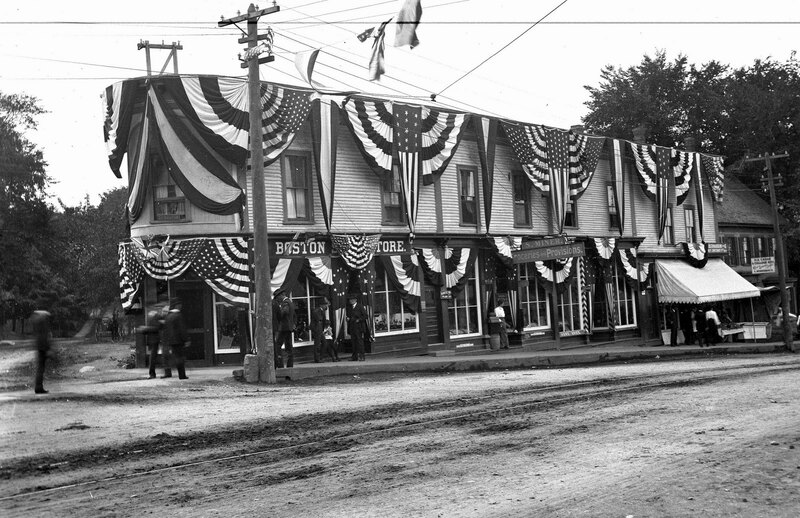 In fact most of merchants who opened businesses on Main Street and built the brick blocks during the first part of the 20th century were immigrants,including the Unobskeys and Olssons. 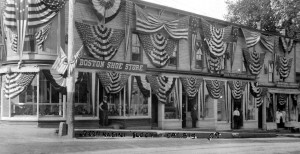 Between 1900 and 1906 the Boston Shoe Store moved to the corner of Monroe Street. 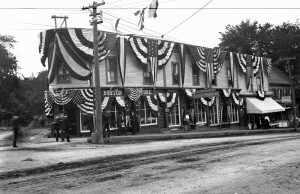 This 1909 Centennial photo is labeled Bernardini Block “09” but we don’t believe Luigi owned the the block at this time. He can be seen to the far right in the doorway of the Boston Branch of L.Bernardini Co. Next door is the Boston Clothing Store which was in competition with Abe Levy’s Boston Store in the next block and Unobskey’s New York Store down the block where the State Theatre was eventually built. It was fashionable at the time to be selling only the latest styles which came, of course, from Boston and New York. The fellow standing in front of the Boston Shoe Store is probably Willard Foster. We aren’t sure when the Bernardini family took over the Boston Shoe Store and presumably the entire block but in this 1912 photo of the interior of the Boston Shoe Store, Willard Foster is still the proprietor. We don’t know which of these gentlemen is Willard. 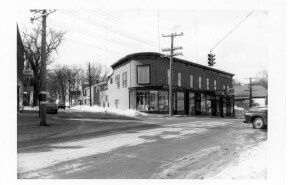 The businesses between the Boston Store and Luigi’s Fruit Market,under the canopy above, came and went on a fairly regular basis but the Shoe Store and fruit store anchored the block for many decades. In this photo S Miner has a grocery store which later became Roy Ryan’s Book Store. When prohibition was repealed Luigi closed the fruit store and opened a bar perhaps because it was more profitable, it was certainly more exciting. During an incident in 1936 a patron became rowdy and was put out by Luigi, by then known to most as Louis, only to return by the back door where Mrs Bernardini blocked his way. When he pushed her aside Louis intervened and was told by the drunk, one Leo Skidds “Keep away from me Louis if you don’t want a bullet” and the shooting began. During a scuffle over the gun another patron was shot, although not fatally, and Skidds was finally subdued and charged with attempted murder. 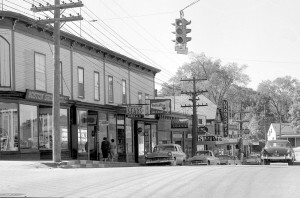 The Boston Shoe Store Block did not change much over the years as can be seen in this 1950’s photo which also shows Hill’sBowlodrome on Monroe Street,a hangout for the boomer generation. Down the block are Sears and a grocery and beer store in what had been Luigi’s fruit market. ​In more recent times Boston Shoe expanded and began carrying a larger line of shoes and athletic apparel. It will be sorely missed and not only by those who relied on it for their footwear. Our Main Street was once a vibrant and even an exciting place especially on weekends, a place to meet friends, bowl, eat, go to the movies or just hang out. The stores carried everything a family needed and more. The loss of another major store on the street is a serious blow to the many merchants who are making such a valiant effort to resurrect the Main Street.